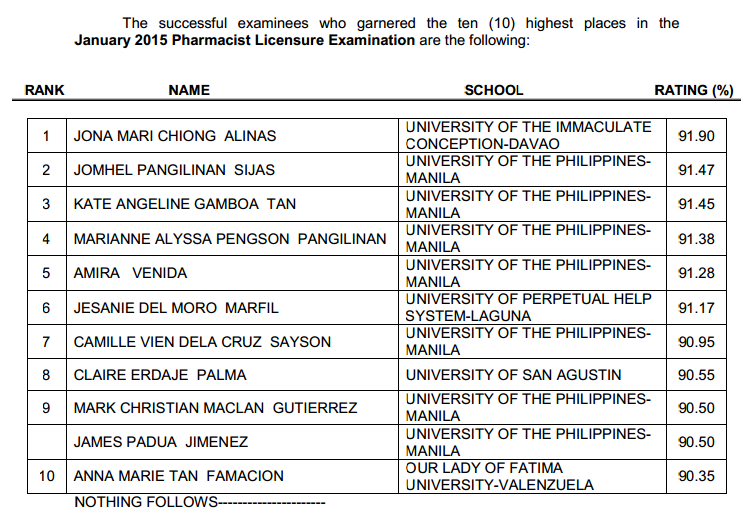 The Professional Regulation Commission (PRC) on Wednesday, January 21, 2015 released the list of passers for January 2015 Pharmacist board exam. Jona Mari Chiong Alinas, graduate of University of the Immaculate Conception (UIC) - Davao topped the board exam with 91.90 average grade. Jhomel Pangilinan Sijas and Kate Angeline Gamboa Tan from University of the Philippines (UP)- Manila placed second and third respectively for having 91.47 and 91.45 percent grade.